Juniper Networks has discovered an alarming amount of malware targeting Google's mobile operating system. The company shares what it describes as exponential growth in a lucrative market that is fairly simple to abuse. Google has been both lauded and criticized for taking a different approach than Apple when it comes to its Android Market. Unlike Apple's "walled garden" approach, Google's market place does not proactively verify and approve mobile applications. Also, the entry barrier into the Android Market is relatively low. This is great because it encourages developers to submit their work, but mix the two together and it makes a delicious target for unscrupulous individuals. 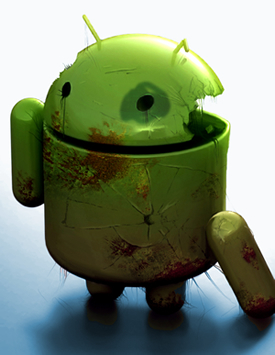 In May, Juniper reported that Android Market was suffering a rapid proliferation of malware. By their numbers, the amount of malware found between 2009 and 2010 had increased by 400 percent. This figure has continued to grow since, but the company now claims the past few months have been the worst in the history of the platform. By Juniper's estimate, there has been a 472% increase of malware since July 2011 alone, not taking into account figures for previous years. The number of malware samples identified in September increased by 28% over the number of the known Android malware samples. October showed a 110% increase in malware sample collection over the previous month and a striking 171% increase from what had been collected up to July 2011. Of the bad apps found, 55 percent aim to steal your personal information and 44 percent are SMS trojans that attempt to steal your money. They do this by sending text messages to premium phone numbers that bill your phone company for each message sent (eg. voting via text on American Idol). The messages are sent in the background, without the knowledge of the owner. One question Juniper always get when discussing our research is if Apple’s iOS is more or less secure than Android? Maybe, but it’s not necessarily because of the security or lack of vulnerabilities in the platforms themselves. The main reason for the malware epidemic on Android is because of different approaches that Apple and Google take to police their application stores. Android’s open applications store model, which the lacks code signing and an application review process that Apple requires, makes it easy for attackers to distribute their malware. There is still no upfront review process in the official Android Market that offers even the hint of a challenge to malware writers that their investment in coding malware will be for naught. Until there comes a time that someone (ever heard of Charlie Miller?) figures out a tried and true way to get malicious applications into the App Store, Android will remain the target of mobile malware writers around the world. Another report from Juniper shows the significance Russia plays as the originators of mobile malware, especially on Android. The article, "From Russia... with Malware?" also illustrates a common ploy used for SMS trojans with screenshots and a thorough explanation.